Small, deciduous tree in the rose family (Rosaceae) with thorny branches. Very showy, crimson, double flowers in spring. Alternate, glossy leaves with three-five lobes and toothed margins. Yellow and bronze autumn foliage. Discovered more than 150 years ago as a sport on a Crataegus laevigata 'Rosea Flore Pleno' plant, and introduced to the trade in 1866 by the plantsman William Paul (England). 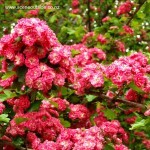 Synonym: Crataegus laevigata 'Coccinea Plena'. Also sold as Crataegus x media 'Paul's Scarlet'. Suitable for a sunny or partially shaded position in any well-drained soil. Crataegus laevigata 'Paul's Scarlet can handle dry conditions reasonably well once established, and is suitable for coastal gardens and windy sites. Does not require much pruning other than the removal of dead, damaged, or crossing branches in autumn or winter. Susceptible to rust, leaf spot, and blight. Frost hardy (to USDA zone 4). Crataegus laevigata 'Paul's Scarlet' looks absolutely magnificent when smothered with frilly, rosy pink blossoms in mid spring. I just wish it would flower for a longer time! Purple-bronze cultivar of Dodonaea viscosa, originally discovered in the early 1890s on a riverbank in Marlborough in New Zealand. 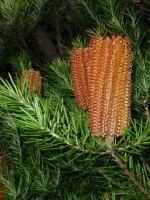 Grows into a small bushy tree or shrub up to 4 m tall and 2 m wide. Narrow-obovate to narrow-elliptic leaves, 4-10 cm long and 1-3 cm wide. The purple leaf colour intensifies during the colder months. Flowers are arranged in terminal panicles to 4 cm long, purplish red, and mostly bisexual. (The species itself produces dull yellow unisexual flowers, usually on separate plants.) Flowers are followed by much larger, winged, purplish red seed capsules in summer. Red-brown, stringy bark. Prefers a sunny or partially shaded position in free-draining soil. Suitable for dry, exposed, and coastal sites. Tolerates light to moderate frosts (zone 9). Intolerant of very wet soils. Soft growth responds well to trimming, but avoid pruning old wood. Lower branches can be removed to create a clear-trunk. Leaf colour is better when planted in poor soil. Makes an interesting specimen tree with attractive bark, beautiful purple foliage, reddish purple seed capsules and, in particular in very windy areas, an irregularly shaped canopy. Excellent choice for hedging purposes in coastal gardens. Cut stems with foliage and seed capsules add an unusual dimension to floral arrangements.